Lenovo is not a new company and it has since been a capable PC manufacturer. A few years back, it started in the mobile-making business as well. After acquiring Motorola Mobility from Google, it gained more attention in the smartphone market. And, India is one of its main markets which is why the Lenovo Phab 2 Pro deserves a launch in the Indian market as well. This great flagship device by the company has launched in many other regions of the world a few months back with an impressive list of specs. This phablet device is great to look at and is impressive to use. Let us check out why it is so popular among the masses. With a decent configuration that we will discuss in a while, the Phab 2 Pro is the next phablet by Lenovo that covers up a dimension measurement of 179.8 x 88.6 x 10.7 mm and weight of 259 grams. This dual SIM phone offers a 6.4-inch IPS LCD capacitive touchscreen display with 16 M colours. A high-end resolution of 1440 x 2560 pixels is also there to support the beautiful and bright screen. The saturated colours with ~459 ppi look so beautiful that users will not be able to make out pixels bursting. Beautiful multi-touch functionality on the device makes the device great to look at for sure. 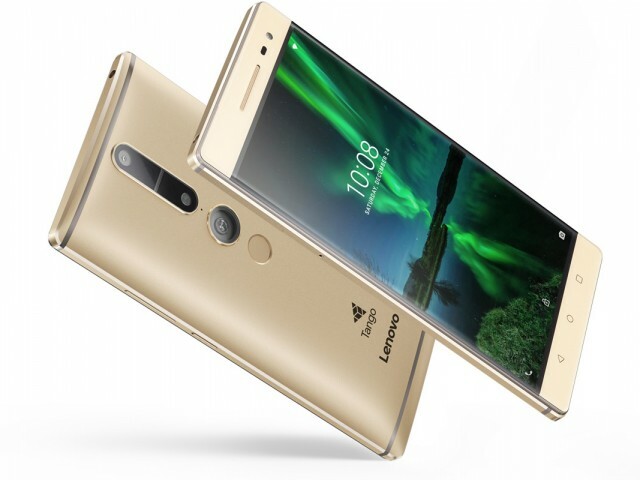 Lenovo Phab 2 Pro’s beautiful metal body is said to be available in Champagne Gold and Gunmetal Grey colours when it launches in India. The Lenovo Phab 2 Pro specs are further defined in quality by its processing power chips. For giving power to the system, there is an Octa-core processor that offers 4×1.8 GHz Cortex-A722 and 4×1.4 GHz Cortex-A53 cores using a Qualcomm MSM8976 Snapdragon 652 Chipset. This processing power is not the best out there, but it does give the device a decent and lag-free processing for multitasking. GPU power is available with an Adreno 510 chipset that is great for high-end gaming as well as rendering graphics from various applications. The Lenovo Phab 2 Pro comes with an Android OS, v6.0 (Marshmallo) which is another good thing. While we still look forward to updates on the latest Android OS v7.0 (Nougat), yet there is no official announcement from the company as of now. But, we can expect updates on the device later on. Lenovo’s flagship phablet comes with an impressive 16 MP primary camera that features depth and motion tracking sensors (3D Tango Augmented Reality Technology) as well. This technology uses augmented reality to map out real-life environment and mix it with the virtual world on the screen. You also get phase detection autofocus on the device. Other camera features that accompany the device are face detection, panorama, HDR, touch focus, geo-tagging. Users will be able to record videos on the device at [email protected] A secondary camera of 8MP is there as well which has f/2.2 aperture with 1.4 µm pixel size. This camera is also able to shoot at 1080p. But, the phablet does not have 4K shooting resolutions. Storage on the device is impressive with its 64 GB of internal storage capacity. An expandable option of up to 256 GB is also available, but that does require sacrificing the secondary SIM slot on the device. Not to mention, the 4 GB of RAM to back up the processing power of the phablet. Lenovo Phab 2 Pro comes with an awesome battery of 4,050mAh li-ion polymer battery which works fairly well to operate the device for a decent number of hours. The phablet highlights an extensive variety of network alternatives, for example, 4G, Mobile Hotspot, GPS, Wi-Fi 802.11 a/ac/b/g/n/n 5GHz, Bluetooth v4.0, and microUSB 2.0. The gadget accompanies a unique mark sensor on the back, alongside different sensors like encompassing light, closeness, compass, gyroscope, and accelerometer. Lenovo looks forward to bring in some great phones and phablets to the Indian market in 2017. And, with the starting of the Lenovo Phab 2 Pro, it does look forward to prove a point. Focus by the company will be on smartphones and phablets with great specs while keeping the budget mid-ranged so that they make sure to maintain their quality as well. Moreover, adding in a unique 3D Tango augmented reality technology in the device might actually work on impressing the users in India. Will this beautiful technology do its trick? What more is to be expected from the device is soon to be seen in the upcoming months. Till then, we wait for the Lenovo Phab 2 Pro to come out in Indian market. The Phab 2 Pro price in India is said to be around Rs. 33,390. Learn more about the device at 91mobiles.com.